are most often the comments and advice of other writers. The Best Writers Resources are the knowledge and experience of others. As Hyman Rickover said, "It is necessary for us to learn from others mistakes. You will not live long enough to make them all yourself." Asking the right questions opens the door to knowledge. Attempting to answer the questions, clarifies our understanding. For only when we attempt to teach others will we truly understand what it is we think we know. With that in mind I created this page where we can all ask the tough questions and share our best answers. This is a "community page". Where everyone can take what they need and share the best that they've learned - 'cause we're all in this writing game together. If I don’t have the answer I'll do my best to find it and meanwhile some other visitor might just have the perfect answer and share it with the rest of us. When we share our questions and concerns, answers and solutions we all prosper - and so do our readers. The most productive writers of the "Golden Age of Fiction" (about 1910-1960) did not write slowly and they did not re-re-re-re-write. They wrote short stories in a day and novels in a few weeks and the still warm copy from their smoking manual typewriters went straight into manila envelopes to editors - all of it fast. Each of them may have used their own unique writing systems but speed was the one thing common to all. Watch this series of 4 videos... to see what they knew that you might be missing! Click here to go to Writing Systems and see "Write a Killer Novel Fast..."
These videos are free - what you'll learn is priceless. Visit "Books for Writers" Add these books to your library so you can read them over and over again. Check out "Writing Myths" here and discover which ones you may be suffering from! Advise from Mark Twain Read "Dictionaries and Synonyms"
What you don’t know about Dictionaries and Synonyms can kill your writing. Visit this page for The latest news about Fiction Writing, Self Publishing, and Books. This article reveals the truth about "Writing Styles". Find out why Writing Styles are NOT something aspiring writers should worry about - and why - although many of them do. This article about "Story Starters" may surprise you. Unless you've already finished at least the first draft of your story you shouldn't be looking for Story Starters. Follow this link to discover why "Story Starters" is probably the last place you want to "start"
This page about "Writing a Novel" will give you a perspective you may have not thought of before. Follow this link to discover why "Writing a Novel" is both easier and harder than you think. Here is a short list of the most important and powerful "Creative Writing Tips" that you've probably ever come across. Follow this link to discover the single most important of all the "Creative Writing Tips" - and why you've probably never heard of it before. This article will answer your questions about "Becoming a Writer". There's more to it than you might have imagined. Follow this link to figure out what kind of writer you should be - and why. For those of you into SF here's a site with some great links to the Greatest science fiction novels. Screenwriting is a special format for storytelling. All the principles of good storytelling apply but the formatting of written movie scripts are very different from that used for novels. At Fun Film Talk their into all things film, whether that means enjoying movies, analyzing movies and the folks who make them, or making movies themselves with the new digital equipment. They also love the art of screenwriting. So if this is your preferred storytelling format - check them out. 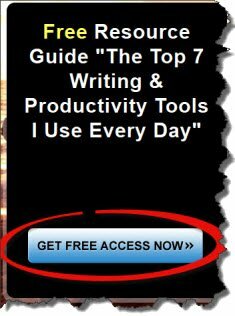 Back to top of "The Best Writers Resources"